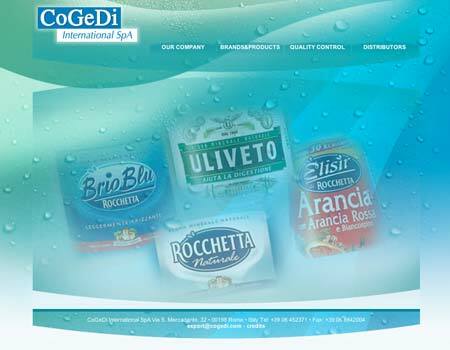 The General Company for Distribution – COGEDI, has been distributing the label market Uliveto Rocchetta, Brio Blu Rocchetta Rocchetta and Elixir. The company’s corporate website was designed and built to be a point of reference and contact information on the enterprise, with specific reference to the international market and foreign buyers, and contains a number of group information Cogedi, products distributed by it and the companies that distribute its products worldwide. Through the four basic sections of the site is presented Cogedi group, its history, its values, mission and establishments, are highlighted values Cogedi regard to quality control and scientific research are presented and trademarks products group Cogedi divided by brand, with links to the particulars in respect of sites, and information about the history, composition and label, etc.., are also supplied all the necessary references to international buyers to contact distributors in different countries.